Gary Gibson is an internationally known, award-winning steel pannist and composer, well-versed in both Caribbean music styles and Caribbean and Latin-influenced jazz. In his most popular group, "Panduo," he teams up with one of his experienced steel pan partners to provide a compact, low-maintenance, high-quality duo highlighting the steel pans over artfully crafted backing tracks. The size of the group can be from solo (Gary alone with backing tracks) up to six live musicians (all live, without tracks—includes two steel pannists, flute/saxophone, keyboard, bass, drums). Since their inception in 1996, Panduo has performed well over a thousand engagements in the Seattle area. Gary and his partner provided a fantastic concert for Father's Day at a retirement community. The residents were thrilled! We definitely plan on having him back again in the future. Thanks, Gary! If your purpose for the music is for ambience/background music, you can expect us to be compact, low-maintenance, and very experienced at reading the preferences of your guests. If the event is to be more of a concert-type event, you can expect us to present an entertaining, polished set of interesting and varied music that will educate as well as entertain. 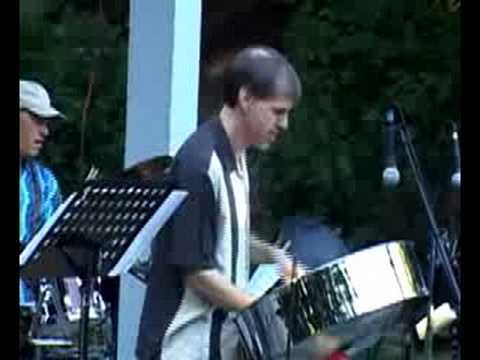 Can you get "steel drum music" a little bit cheaper in Seattle? Yes, you certainly can. But you should ask your candidate groups just how long they have been playing the steel pan, And the musicians they hire...what is their experience playing this type of music? How seriously have they taken learning the instrument? The point is, not all steel pan players are the same. Some play at higher levels than others. It really, truly does make a difference in the presentation at your event. Gary Gibson is an internationally known, award-winning steel pannist and composer, well-versed in both Caribbean music styles and Caribbean and Latin-influenced jazz. In his most popular group, "Panduo," he teams up with one of his experienced steel pan partners to provide a compact, low-maintenance, high-quality duo highlighting the steel pans over artfully crafted backing tracks. The size of the group can be from solo (Gary alone with backing tracks) up to six live musicians (all live, without tracks—includes two steel pannists, flute/saxophone, keyboard, bass, drums). Gary Gibson has been playing steel pan for thirty years, and is a winner of the "Superbowl of Pan," Trinidad's "Panorama National Steel Band Championship" (2004, with the Exodus Steel Orchestra). He has released four critically acclaimed albums of his own original music. Known also as a composer, he has done commissioned works for numerous steel bands, for symphony orchestra with steel band, and choir with steel band. In 2009, won two out of three categories of the 2009 "Symphony & Steel Composition Contest" held in Trindad. He holds a Masters in Music Performance degree, and spent ten years as a music instructor on the faculty of Cornish College of the Arts (Seattle) and Chicago State University (Chicago). He maintains a schedule as a traveling concert artist, appearing as guest soloist with college and university steel bands across the United States. As important as he has become in the national and international steel pan community, his "bread and butter" is still happily performing with his own groups in the Pacific Northwest United States. Since their inception in 1996, Panduo has performed well over a thousand engagements in the Seattle area, and has traveled as far as Hong Kong, where they performed for the 2000 New Years Millennium Celebration. Everything from corporate events to concerts, weddings to party boat cruises, birthdays to wakes (yes, wakes! ), company picnics to backyard barbecues. Clients over the years have included Microsoft, Boeing, Nordstrom, Costco, Washington State Ferries, QFC, Tully’s Coffee, Ikea, Holland America Line, Argosy Cruises, Waterways Cruises, Tommy Bahama, AT&T, Maritime Gig Fest, San Juan Island Yacht Club, Museum of Flight, AAA Washington, The Office of the Mayor (Seattle), U.S. Conference of Mayors, Washington Wine Commission, Getty Images, Emerald Downs, Seattle Parks and Recreation, City of Kent, Federal Way Parks Department, City of Lynnwood, City of Renton, Tukwila Parks & Recreation, City of Shoreline Parks, Richmond Beach Parks & Recreation, Edmonds Arts Council, PONCHO, Boys and Girls Clubs, numerous schools, shopping malls, property management agencies, and hundreds of private clients for weddings and other private events. The repertoire of Gibson's groups contain a healthy dose of the expected calypso and soca music, but also mixes in the influences of Latin and Brazilian jazz, some Reggae instrumentals, and several well-known pop tunes. There is also more than an hour's-worth of seasonal holiday tunes in the repertoire. "Last night was amazing! I think it was our best dinner so far. I just wanted to say thank you so much for coming out and playing for us! It was a wonderful performance! Everyone loved it and I'm so happy that it got everyone dancing! We will definitely keep you in mind for next year's event." - Holly V.
"Thank you very much for the uplifting and fun performance. 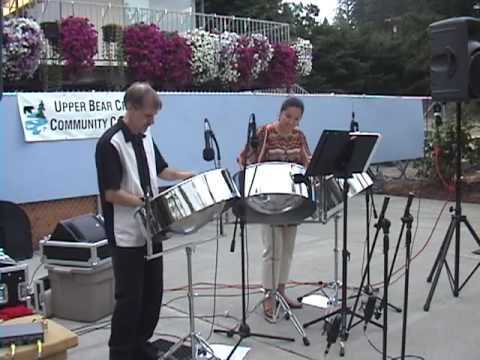 Your steel drum music makes everyone smile and puts a little wiggle in their step! As always, it is a delight to work with you and I know people in attendance really enjoyed your music. Panduo's performance is a welcome addition to the event and is one of the things they look forward to every year." - Lesli O. "Today is my birthday and you have given me the best present I've recieved all day–the gift of hearing truly professional steel drum players. Thank you so much!" 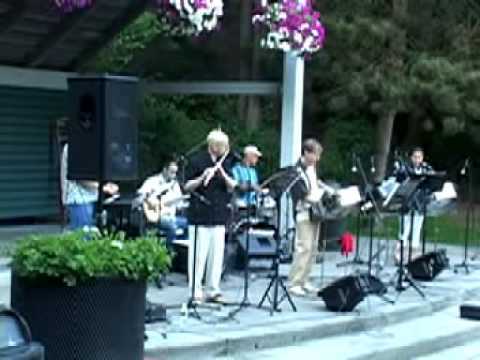 - Kathy S.
"Thank you for providing such great music at our Annual Employee Event. Your duo really added just the right touch to the entire event. We look forward to having Panduo entertain us again!" - Angie E.
"You were right! We should have hired you! The group we settled on was late, too loud, and played music that really wasn't what we were looking for. Next time, we'll understand what an extra twenty-five bucks can buy..." - Lorraine N.
"Panduo was such a great item to include and added so much to the party. it created an extremely festive environment! You were so good to work with. Again, thank you!" - Hillary O. Load in. Obviously, we'll need access to the performance area. This can be by drive-up, or by hand-truck load-in. Several pieces of our equipment are very heavy, and so if a whole flight of stairs are involved, a load-in surcharge may apply. We need to set up on a flat, fairly even surface, because our speakers and instruments are placed on tripod stands. The flatter the better. We can work on grass or ground as long as the grass is dry, and the ground is flat. A slight slope is acceptable. There are two reasons we need to keep dry in our performance area: 1) since we use electronics as a part of our set-up, there is a safety concern, and 2) our instruments are made of steel, and moisture causes rust spots. The space needs to be shaded, because our instruments will heat up in direct sunlight and go out of tune. This applies primarily to the summer months, and only up until about 8 or 9 p.m. In a pinch, we can provide our own shade with large shade umbrellas, but these are not ideal, because they aren't very attractive, and if the sun is in front of us, they need to be placed such that we are behind them from the audience perspective. We can set up on any surface that is even, dry, and shaded, including pavement, grass, wood decks, etc. Electrical. Since we require amplification for our accompaniment tracks, we do need one standard 110v electrical outlet within 75 feet. We draw just a little more power than your typical blow dryer, so we've never blown a circuit. We can also play in locations that do not provide electrical power if you provide a 2500-watt generator. These rent at most places for about $45 for a day. Please note that if your event is in a public park, you should check with the park administration about whether amplified music is allowed in the park or not. Panduo has been cleared previously for performance in some parks that usually do not allow amplified music, since we do not necessarily have to amplify our instruments (making our P.A. system just a very large boom box, in essence), and since our music tends to appeal to such a wide group of people that complaints are quite unlikely (hasn't happened yet!). Our style has been influenced by the merging of our jazz interests and experience with the music of Trinidad (and the Caribbean in general). Specific artists might include Andy Narell, Lord Kitchener, and Bob Marley to name just a few. "Panduo was such a great item to include and added so much to the party. it created an extremely festive environment! You were so good to work with. Again, thank you!" "Thank you for providing such great music at our Annual Employee Event. Your duo really added just the right touch to the entire event. We look forward to having Panduo entertain us again!" "Today is my birthday and you have given me the best present I've recieved all day–the gift of hearing truly professional steel drum players. Thank you so much!" "Thank you very much for the uplifting and fun performance. 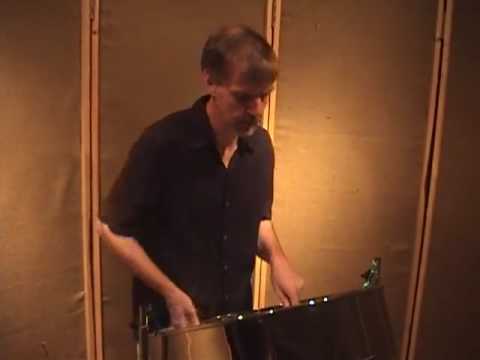 Your steel drum music makes everyone smile and puts a little wiggle in their step! As always, it is a delight to work with you and I know people in attendance really enjoyed your music. Panduo's performance is a welcome addition to the event and is one of the things they look forward to every year." "Last night was amazing! I think it was our best dinner so far. I just wanted to say thank you so much for coming out and playing for us! It was a wonderful performance! Everyone loved it and I'm so happy that it got everyone dancing! We will definitely keep you in mind for next year's event."